You are here: Home / Financial Planning / The 7 Most Important Personal Finance Ratios You Need To know! The 7 Most Important Personal Finance Ratios You Need To know! Every market savvy person must be aware of the importance of fundamental and technical analysis for evaluating a company. Charts, graphs, and ratios are at the crux of such analysis. Financial ratios form an integral part of a company’s financial statement and help to compare the performance of various companies at different time periods. The ratios help investors to take correct investment decisions. In the same way, if an individual wants to evaluate his/her personal financial situation, based on the financial statements, considering the net worth or cash flow, or whether he/she has over-borrowed or has good liquidity, it can be determined by calculating Personal Finance Ratios. The components involved in deriving the appropriate ratios are discussed in detail below. 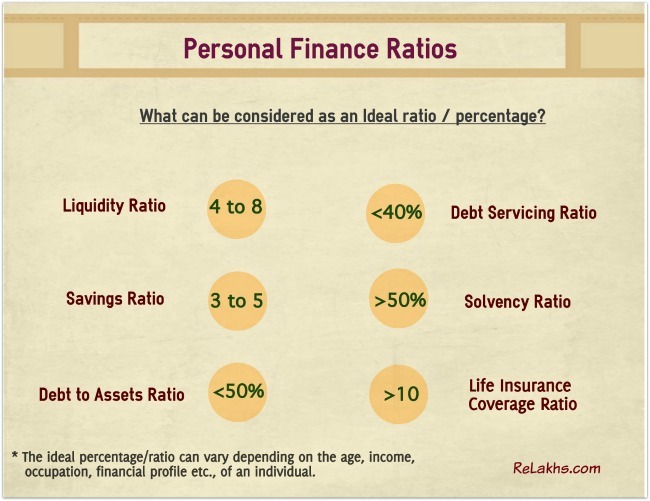 Personal financial ratios, unlike corporate ratios, are pretty simple. These seven ratios can help evaluate your financial health. This ratio is the indicator of a person’s ability to meet his/her regular expenses in the event of a contingency or unforeseen circumstance. In other words, how many months will your money last for if all your sources of income stopped due to any unexpected circumstances? Basic Liquidity Ratio (BLR) can be used to determine how many month’s expenses are provided for in the form of liquid money i.e., cash or near-cash assets. Cash (near cash) comprises all liquid assets like, bank savings accounts, cash in hand, fixed deposits, Liquid mutual funds. Monthly expenses are your gross expenses that u spend on a monthly basis includes both discretionary as well as non-discretionary expenses. The ratio helps a person to be aware of his/her financial liquidity. It’s important to maintain a fixed level of liquidity to ward off unexpected financial hardships. Example : Mr Kuberan has Rs 30,000 as cash at home & Rs 55,000 in Savings a/c. His monthly expenses are around Rs 15,000. What is his Liquidity Ratio? What would be considered as an ideal Liquidity ratio? – Anything around 4 to 8 months can be considered to be good, which means you need to have at least 4 times your monthly income parked in cash/near cash assets as an contingency fund (emergency fund). The ideal ratio can vary across age groups & income profiles. If you have stable income, you may need a lower liquidity ratio. This ratio reveals the amount a person should keep away as savings for his/her future goals. Gross income includes money earned from salary, or a business or profession, bonus, dividend, interest, royalty/rent and all forms of earnings. Example : Mr Kuberan (35 years) has around Rs 20,00,000 as investments in mutual funds, fixed deposits, PPF, bonds etc., His annual salary is Rs 5 Lakhs. What is his Savings to Income Ratio as of now? One question that people often ask me is how much of my income should I be saving, the answer to which is there is no one ratio for all, it depends upon a persons age, his Income and financial life goals. Of-course the higher the Savings ratio the sooner you can reach your goals. It helps people to understand whether they have over-borrowed (or) are in some uncomfortable position i.e. they are facing solvency issues. Debt to asset ratio should be used while taking a new loan. If you have already borrowed beyond your repayment capacity, it’s advisable to not take a new loan. That will increase your liabilities. A better idea would be to wait until the time you square off your existing loans. Total liabilities includes common debts like car loan, home loan, or personal loan, credit card dues, money borrowed from private lenders etc. Total assets include all that an individual owns. These include investments, cash, car, house, jewellery, land and property, computers etc. If you consider only ‘Liquid assets’ (like cash, savings a/c balance, deposits etc.,) in place of Total Assets, this ratio can be called as ‘Liquid Assets Coverage Ratio’. The ideal debt to asset ratio can be maximum 50%. It is advisable not to have the debt (loans, credit cards) go beyond 50% of your total assets. In today’s world, we buy most products and services on credit. Payments are largely made by credit cards or post-dated cheques. But it’s important to control your debt. The debt servicing ratio measures your debt obligation against your monthly income. In other words, what is the ratio of your EMI to the income? You must never let the total debt obligation cross 40% of your total income. But unfortunately, the situation is very different now. The ratio for most individuals living in urban areas, have touched dangerous levels. Besides, increased interest rates have further compounded the misery. Increased debts exert a price on an individual’s lifestyle. You can also calculate total liabilities (outstanding loan amounts instead of EMIs) to total income to find out your ‘Debt to Income’ ratio. Your objective should be to move from a situation of high debt (if any) and low savings to a situation of no debt and high savings as your age/income increases. Hedging inflation is a strategy which provides protection as and when the value of the currency plummets. An inflation hedge usually involves investing in assets that has an historical ROI (Return on Investment) of more than that of the inflation. Saving instruments like FDs may seem to offer a safe returns. But once you factor in the inflation, you might actually be loosing your money. For instance, if you invest in an FD that offers 6% returns post tax, at a time if the inflation rate is 7%, then you are actually losing your buying power. Assets that are considered inflation hedge are usually self-fulfilling. Investors resort to them to get a real rate of return (i.e. A return in excess of inflation rate). Assets like Equity is widely accepted as an inflation hedge investment. The ratio at which you should invest in Inflation edge assets (like shares or equity mutual funds) depends upon factors like your age, risk appetite and your financial life goals. Simply put, the solvency ratio will help you know whether the assets in your portfolio are adequate to service your debts. As you progress in life, you acquire assets and use the debt to finance them. But in many cases, the amount of assets is less than that the amount of debt. The net worth of a person is the difference between his/her total assets and liabilities. The net worth is positive if the market value of assets is more than the liabilities. The assets in this case include all bonds, equities, fixed debts, mutual funds etc. Even the cash in your savings bank account and the money you have kept under the mattress should be considered. If your total debt is Rs 50 lakh and the total assets are Rs 35 lakh, then your solvency ratio is negative 0.42 (or -42%). Solvency ratio of > or = 50 can be considered to be good. This ratio can give your an idea if you have an adequate amount of life insurance coverage or not. The net worth of a person is the difference between his/her total assets and liabilities (financial & physical assets minus your loans). Example : Mr Kuberan has total assets worth Rs 50 Lakh (including house property, gold, bonds, shares etc.,) and has an outstanding home loan amount of Rs 25 Lakh. He has taken a Term insurance life cover of Rs 30 Lakh. He earns an annual salary of Rs 5 Lakh. What is his Life insurance coverage ratio? This article has been co-authored by Kishor Kumar & myself (Sreekanth). Interesting information! Thanks for sharing such a valuable information. I am NRI aged 47 years and want to retire at 52 years by that time my children will be in their final year of graduation I have constructed a home and rent out three portions and have my separate portion and getting rent of 65K per month and saving around 50K per month for my children education since last two years and will continue to do until they complete their education. Other than that I have deposited 80lacs in FD which is renewed on annual basis with the accumulated interest. My current monthly expenses is around 75K I dont have any loans/liabilities outstanding. 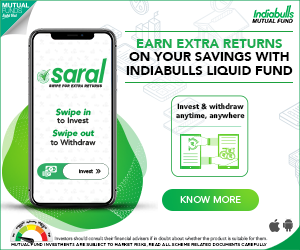 However, I would appreciate your guidance for investing an additional amount of 50lacs (though I believe in FD since the money is guarantee albeit with less returns) and which would be the best option at present. Thank you. I assume that your children are studying +1 / +2 now. May I know where are you saving for the last 2 years? Have you planned for your retirement life? Did you calculate the approx required regular income during your retirement? Thank you for sharing your views dear Manja. Hello Shrikant… Its jus awesm article. I like your blog and your expertise unbiased advice to all individuals. 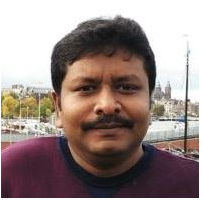 My Names is Raj 34 years old working for a shipping company in small hamlet Hos pet in Karnataka. Until last month I was not very serious about any fruitful savings till I diagnosis with per-diabetes recently (expected in late 40’s as my parents have diabetes in their mid 40’s). Me married with 2 kids (6 years and 2 years old) and my total take home salary after all PF,IT deduction will be roughly around 75K per month and my total monthly expenditure is about 30K. 1. Max New york Pension Growth fund : Opted in 2010 for quarterly payment of INR3750. Keeping all in view, have savings of around 25K per month and thus much appreciate your advice on further savings / protection plan for life term etc.. Both life insurance plans are ‘unwanted’ ones. Especially TATA plan, its an endowment plan. 1 – Cosnider buying a Term insurance plan for atleast Rs 1 cr and then discontinue TATA policy. You may have to book losses on the premium paid. Term insurance plan Vs Endowment life insurance plans. 2 – Buy a stand-alone Personal Accident plan. 3 – Do you have health cover for self & family (spouse, kids & for parents)?? 4 – Kindly use calculators available in these articles to calculate required savings for kid’s education goals & for your retirement planning. Can you please suggest some good mutual fund to invest for long term. Greeting for such a good and informative post. 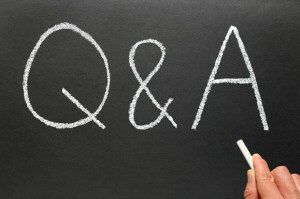 Appreciate that your personal and family reason to help people and regularly answer all the queries in unbiased way. We recently moved back to India and we do not have any investment and health coverage as of now. I am following your blog since last year when I was in USA. My family (me and my wife) are around 33 year old with one 3 year old son and each earn around 8 lakhs per years (private company that do not contribute to EPF). We are about to do following investment/life coverage as of now but before finalizing that I would like to get you frank and unbiased opinion that you are giving to all the readers from years. We live in Delhi and we are about to finalize loan that will be about 20-25K per month for home. We are not expecting any other loan liabilities in near future. Additionally we have some other 7lakh total that we want to keep as emergency so have in the form of FDs and some 2 lakhs in account. We have decided to do following. 1) 70 lakh LIC eterm insurance for 35 years (25K per year)- me and my wife each separately- I trust more of LIC because of settlement despite having higher premium. Above description are for me and My wife will also have everything done similar like me. After all the home loan, investment and protection, we have some oher developmental fee for kids a school (max. 1 lakhs) so we will have total 3lakh/year for whole family in hand for food and live a moderate life. a) Protection- It cover life, health and accidental but do you think that protection are enough or do I need to take additional protection like critical illness? I have moderate asthma and my family history may have arthritis. Is that coverage enough or shall I take another term plan for 30-40 lakhs from other company to increase protection? b) Accumulation- Do you think that is good considering my salary? Is it going to cover the cost of child higher education in abroad and our retirement? Do you want to increase/decrease fund for something or suggest to put that fund in some other scheme/lic/fd/post office etc. Thank you for your kind words and for following my blogs. 1) Emergency Fund : Kindly let me know your approx monthly expenses (including projected EMI). Are you planning to utilize the FD amount for down-payment (property)? 2) Kindly go ahead and buy Term plans. You may consider taking a stand-alone Personal Accident insurance policies too. 3) You may enhance your Health insurance cover through a Super Top-up health insurance plan. Read: Best Super-Top up health insurance plans. 4) NPS is not a great option. May I know your views and the reason for selecting this option? 5) Kindly read: Retirement planning goal & calculator. 6) Kindly read: Kid’s Education goal & calculator. 7) Depending on the medical history of your family, suggest you to buy a Critical illness plan. Read: Best portals to compare health insurance plans. Thanks for the quick reply SreeKanth. 1) approx monthly expenses (including projected EMI for home, child education, food and all the other expenses) is 80K including everything. After everything, I am saving (or expect to save) around 45-50K, Shall I put 35K in mutual funds? I am not keeping those 7lakhs for down payment but keeping it as emergency fund. Do you suggest to use this as down payment of homeloan EMI? 2) since LIC eterm already cover natural as well as accidental causality so talking Personal Accident insurance policies can just include disability allowance. Please Correct me if I am wrong. 3) Super Top-up health insurance plan looks good. One question- My Apollo munich restore health insurance has coverage to 3lkhs so does this mean that 3Lakhs deductible can be covered as deductible if I will take super topup plan? 4) I am choosing NPS because govt gave additional 50k benefit for NPS, i think in 80CCD (other than 1.5 lkhs in 80C). But NPS falls in EET category so at the moment I am trying to save 20% of tax but most probably I have to pay equal tax if not more at maturity (withdraw). – I am heading toward droping the idea of putting 50K/year, rather, do you suggest in mutual fund/share market then? 7) Asthma is arthritis is not covered in most company critical illness but I may be wrong, I have not searched for all companies. 1 – You may keep around Rs 5 Lakh as E.Fund. The remaining amount you can invest in mutual funds for long-term goals. 2 – Yes. But having a risk cover for ‘disability’ is very important. 4 – My vote : MFs. But if you have the expertise to pick right stocks at the right time, surely STOCKS. 7 – Each company will have the pre-existing disease waiting period, generally it can be around 2 to 4 years. Great Article. I re-quote from the above profile “financial literacy and discipline is the key to one’s financial freedom”. Every now and then we see people aspire for Financial Freedom but seldom people have the discipline and set aside goals to achieve it. And surprisingly most of them are highly educated and are quite successful in their areas of work. For example, an IT professional who is an expert in managing excel seldom maintain personal excel files which can keep track of these Personal ratios. Almost all professionals nowadays are driven with numbers, I hope that with these fantastic Personal Ratios, people will follow this. Again, great article for common man!